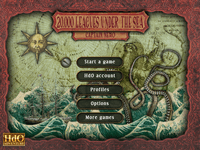 Inspired by the Jules Verne novel, 20,000 Leagues Under the Sea. French scientist Pierre Aronnax, his faithful servant Council and Canadian harpooner Ned Land are captured by Captain Nemo, who sailed the oceans of the world aboard the submarine Nautilus. Although impressed by the beauty of the seabed, our 3 friends still hope to regain their freedom and their earthly life. But Captain Nemo did not share that opinion ... Can you help them escape?